The investment controversy today has much more to do with fundamentals than company specific concerns in our view. There seems to be consensus around the idea that LYB will continue to buy back stock and will continue to pay its dividend with its free cash – with the uncertainty surrounding how low polyethylene margins could go and therefore how limited a share buyback might become and whether the dividend could perhaps be at risk. The same argument applies to WLK, but the company is now more focused on the PVC chain than the polyethylene chain, and here it is a question of PVC recovering from a low and the timing and magnitude of such a recovery. Only Westlake has grown its dividend more quickly than LYB in recent years – Exhibit 3. 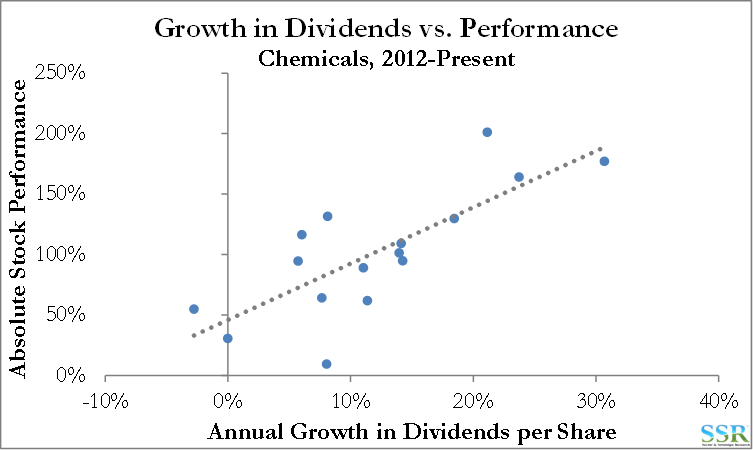 There is a fairly tight correlation between dividend growth and performance in the chemical space (Exhibit 4) and while we would advise LYB to keep going with the share buyback, some dividend growth consistency is also important. Generally, commodity stocks do not perform well in a period of negative revisions, and we do think there is risk of this over the next 9-12 months – we do not believe that the revisions will be as negative as the stock price discounts. Consequently, we believe that the downside is limited relative to the potential upside – but the stock could get as much as 10-15% cheaper in a period of significant downward revisions. 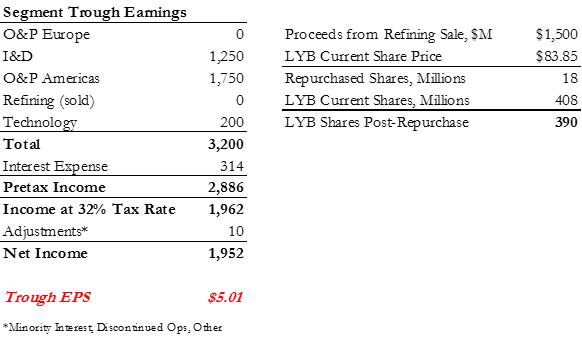 LYB’s US margin protection with crude assumed to be $50 per barrel and natural gas at $3.00 per MMBTU drives an earnings estimate approaching $5.00 per share. A major dilutive acquisition from LYB would not sit well with investors given general market nervousness. We believe this to be unlikely, but a departure from the buyback path would not go down well. A merger would depend of which whom and the structure of the deal, but we cannot see a better and less risky strategy than sticking with the current plan. Everybody knows that the US is adding as much as 30% to its ethylene capacity base between now and 2020, with further possible additions post 2020. The driver is abundant NGL feedstocks in the US driven by the “shale wave”. A Trump presidency will not slow this down, given an even greater desire for energy independence than the Obama administration. If anything, the Trump administration’s view on trade may limit (although unlikely) LNG and NGL exports from the US which would make ethylene feedstocks even more abundant and attractively priced in the US. By contrast, of course, any bold trade move will likely limit the ability of US based producers to export all the chemicals and plastics which these investments require. Assuming no change on the trade front, let’s put what we can see into perspective. The US has 5 new ethylene facilities expected to begin operation between now and the end of 2018 (according to WoodMac). While they show a chance that Indorama will restart an old facility in late 2018, they expect all other projects – Shintech, Sasol, Westlake/Lotte, Total, Shell etc. – to slip into 2019/2020 and beyond. 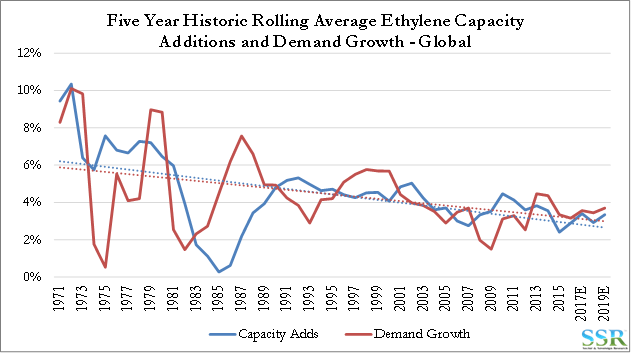 In Exhibit 5 we show additional available ethylene capacity by year, based on the most recent WoodMac analysis and also show what each yearly increment means in relation to total global capacity. The availability is based on the timing of start-ups and 2018 is more a function of the later 2017 additions having a full yearly impact than new plants starting in 2018. For 2019 we have assumed the full effect of the small Indorama restart and we have assumed one additional new large facility for the full year – more likely part years for Shintech and Sasol. The odds of this chart being correct are limited – as it is almost inevitable that we will see delays. Dow and Exxon are employing new technology around furnace design in attempts to meet stricter carbon abatement rules around their locations, and it is likely that CPChem has the same issues. Also these are very large facilities and while we may get one on time, the odds of all three coming up as planned is very low, while the odds of an early start-up is likely zero. As we put the US start-ups into a global perspective we get a picture that could look like Exhibit 6. The key word is could, for a number of reasons – mostly related to things we cannot see or foresee accurately. 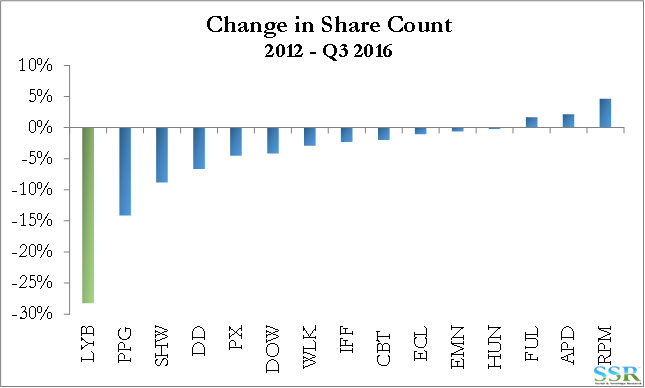 Note that the large capacity jump in 2016 is greater than 2017. This includes the large Sadara complex and the new Mexico complex as well as significant new capacity – much of it coal based – in China. Capacity additions outside the US are limited post 2017 and we may even see some declines if China is serious about curtailing coal production and use. Ethylene is not as material as many other products – such as PVC, methanol and urea – when we look at China coal based capacity, but it is not insignificant. 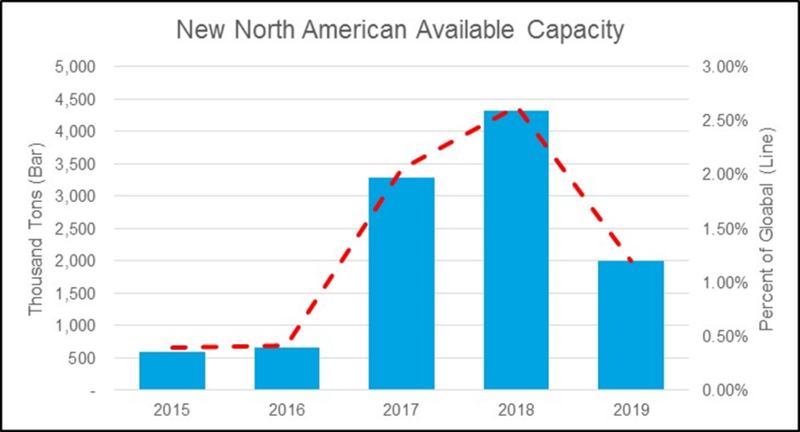 Capacity additions may slip – they are never early – this is just as true of other locations as it is of the US. Demand is the real wild card. Given the more heavily weighted consumer focus of the ethylene chain, versus propylene and others, we are assuming a higher than trend demand growth in our assumptions – though not inconsistent with the last couple of years – Exhibit 7. 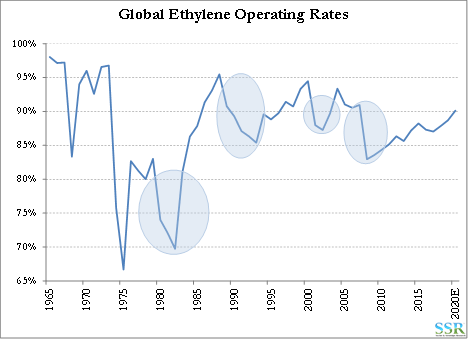 The very high demand growth experienced in the 1970s for ethylene was driven by fast food and supermarkets – packaging for food as Europe and the US moved from a local market culture to a large supermarket culture. The argument that recent above trend demand (Exhibit 4) is being driven by the same rapid moves in Asia and other developing markets – with consumers wanting more choice, more convenience, greater food longevity and greater food safety – makes sense to us and may be relatively inelastic with regard to overall economic growth. The big swings in the demand growth of the ’70s and ’80s were largely due to inventory and very inefficient supply chains with the US and Europe essentially supplying global demand – we do not think that these risks exist today to the same degree although over a few months, inventory changes can make a material difference to apparent demand. Clearly economic growth still matters given the impact of 2008/2009 on the demand line in Exhibit 4, but since that time we have recovered to trend, or above trend growth with anemic global economic growth. Summarizing all of the data above we get the operating rate profile shown in Exhibit 8. There is a decline in operating rates – as implied in Exhibits 6 and 7 – in both 2016 and 2017, but the overall picture does not show either the troughs or the rapid declines that have been associated with prior collapses in ethylene pricing and margins. “Peak” operating rates appear to be trending down over time and some of this can be explained by longer plant shutdowns – in part because of increased complexity but also in part due to stricter regulations on emissions/safety etc., which add more time for inspections and other testing. Our analysis suggests a bump in the road for ethylene in 2017 and into 2018, but it is unclear whether the bump is severe enough to impact the overall strength and structure of the market and materially dent margins. 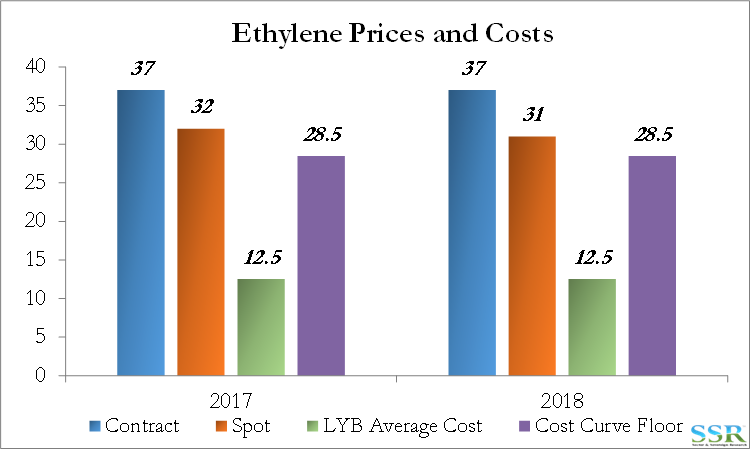 If we are wrong and if there is enough of an overhang for the global ethylene/polyethylene market to retreat to cost curve driven economics – something we have not seen since 2014 despite the capacity additions of 2016 – the US still has a cost advantage. 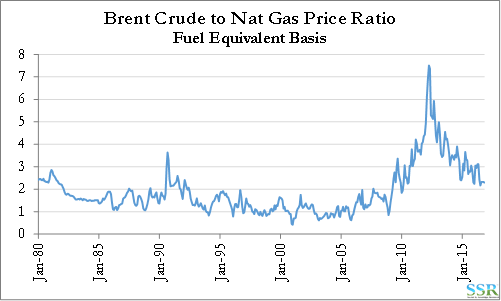 Prior “zero” or “near-zero” margin troughs in the US occurred in periods of relative parity between crude oil and US natural gas. The US Crude oil to Natural Gas ratio is well off its peak – Exhibit 9 – but it is also well above its trough and with NGL’s abundant – the US still retains a significant margin umbrella. 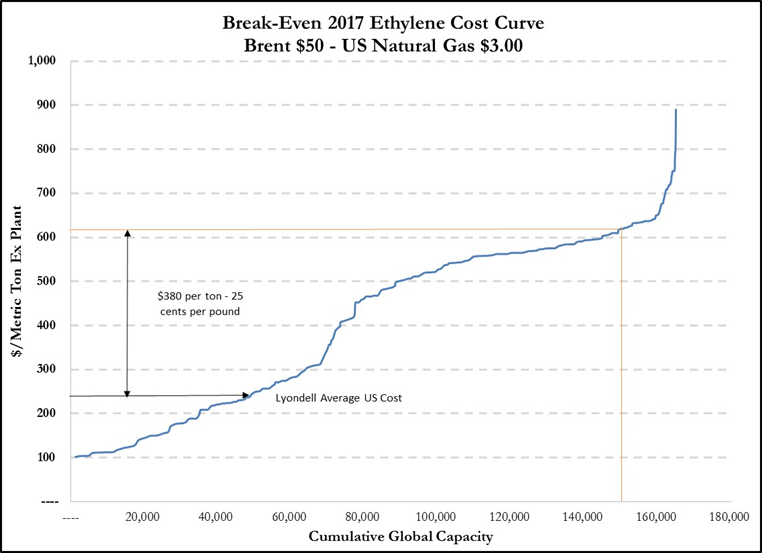 Our cost curve model for ethylene is sufficiently complex to draw the sort of broad conclusions that we require for this analysis. Our work gets us 90-95% of the way to the right shaped curve and the right answers and that given all of the variables in the ethylene business, that is as close as you will ever get when trying to forecast. Our model is constructed on a plant by plant basis. If we assume $50 for Brent Crude and $3.00 for US natural gas we get the curve outlined in Exhibit 10. This is based on what we believe will be operating capacities in Q1 2017 and global demand for ethylene in 2017 of around 153 million metric tons. In Exhibit 11 we summarize what our model generates for LYB in the US on a cash cost basis – with this cost assuming ethane trades at fuel value plus extraction costs – this inflates the costs versus recent history because ethane has traded below its full cost of extraction. We are trying to paint a worse picture here and we are assuming that ethane exports push prices higher relative to fuel equivalent value. In Exhibit 12 we show LYB US costs (as calculated by us) relative to current WoodMac price forecasts and the break-even number generated in the cost curve. 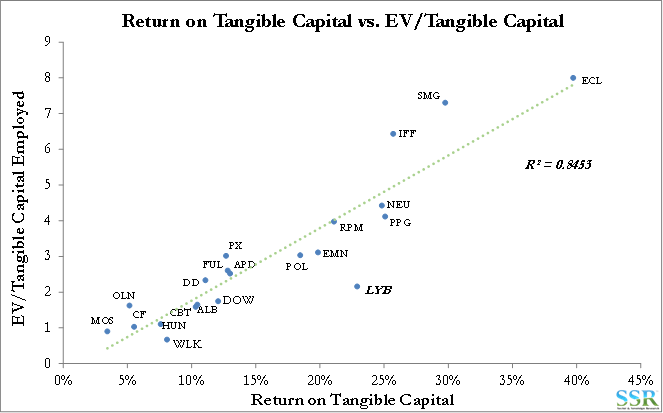 Only TSE looks cheaper than LYB today on an EV/forward EBITDA analysis – Exhibit 15. 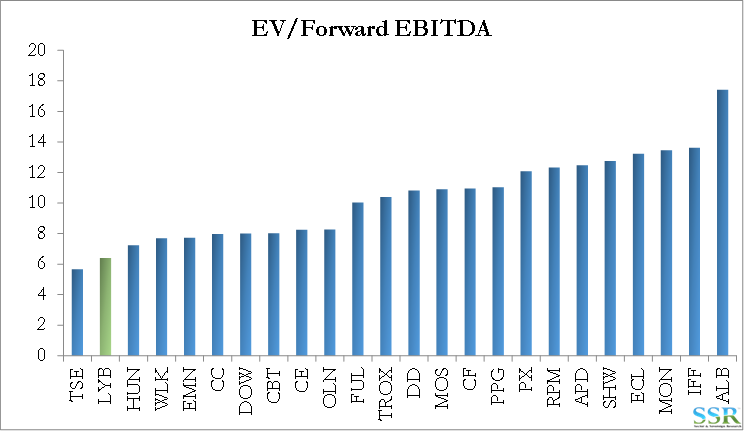 Clearly this implies an expectation that forward EBITDA estimates are too high. 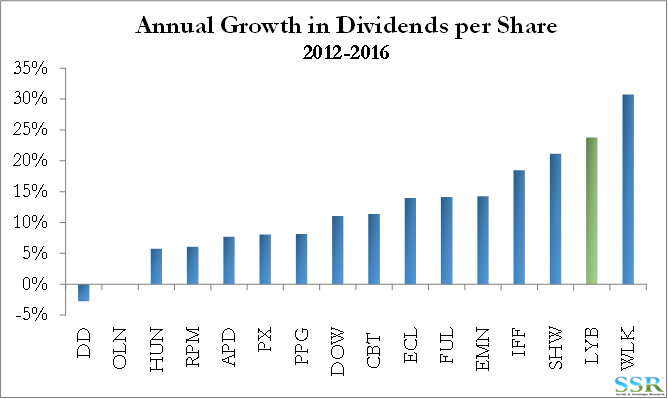 Our trough analysis above would give a trough EBITDA of around $4.0 billion and a trough multiple of just over 10x, which is not unreasonable and low versus other commodity names in prior troughs.